On this day in 1983, Southport picked up a win over local rivals Marine in the Lancashire Floodlit Trophy. Whilst the game itself wasn’t particularly memorable, to the club board it they thought it should have been. Alex Gibson had been in caretaker charge of the Sandgrounders since Russ Perkins had departed in the middle of November. It was supposed to be a very temporary appointment as the club sought applicants for what was, despite the clubs recent troubles, still a very popular job. His first game in charge saw a 3-0 win at Skelmersdale in the Floodlit Trophy and whilst it may be a competition that some chose not to care about, as we progressed through the later rounds with the game referred to below we would later thank Gibson for the result!! Less than a week prior to this match (7th December), in the home match day programme against Hyde, a large piece by chairman Gary Culshaw had set out why Southport felt they had the right man for the job in Bob Murphy. Embarrasingly however Murphy didn’t actually take charge of the game. He had changed his mind within 2 days of the appointment much to the frustration of the board. Gibson continued in place and his side continued to pick up results and were unbeaten over the next 5 games (this game included). 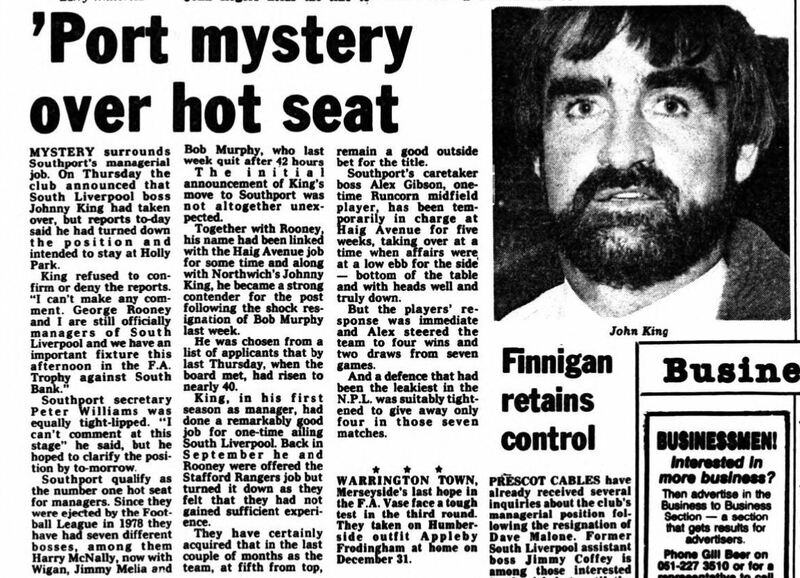 With the Murphy embarrassment behind them, Southport had then been set to name South Liverpool’s John King as their new manager and the match against Marine had been set to be Gibson’s last in charge. However the news leaked before King was able to advise the Holly Park Club of his decision to leave them and, despite applying for the job vacated by Murphy, King promptly wrote himself into the managerial record books by quitting the post before it had been officially announced that he had agreed to take over. After 3 managers in 3 weeks had gone by the wayside the board decided to give caretaker Alex Gibson an extended run.